I’ve been doing some online research and found your article on the Honda Pioneer 1000 problem. We have had a lot of luck with our machines, but a lot of our friends in the industry are coming to us for help because they seem to be replacing clutches all the time. We know the basic cause—driver error and overheating—but we haven’t busted into our transmission yet to see what’s wearing out. Again, ours are great, but if my clutch was an issue, what would I expect to see? Thanks for the help! 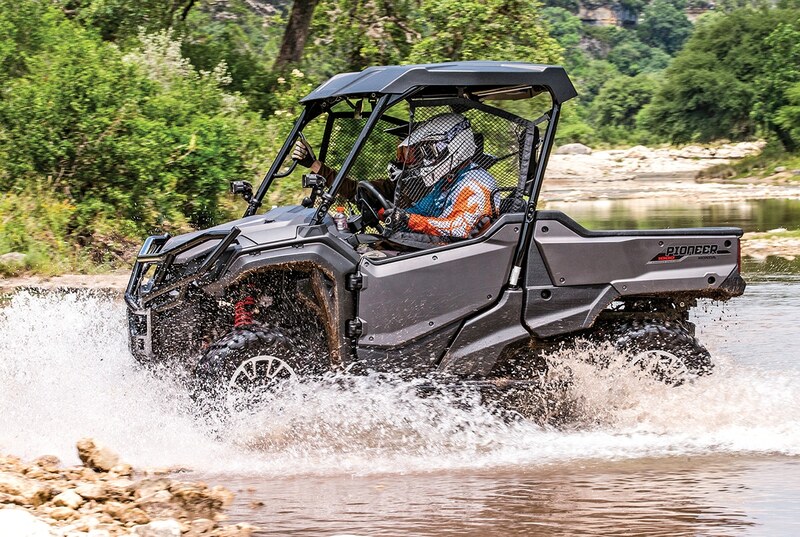 According to Honda, all the Pioneer 1000’s clutch problems are driver error. Basically, if you are not on level ground at speed, they want you in low range to stop the #1 clutch packs from slipping and overheating. Slow-speed work in high range with passengers and/or cargo/towing a trailer will cause the clutch packs to slip and overheat. And don’t even try to get out of a mud hole if your tires are in gumbo mud and don’t want to turn. And, you can’t use reverse to back out because that is a bit too tall and will burn the #1 clutch packs further. Your only Honda-approved remedy is to be towed or winched out! Once the friction material overheats and glazes over, the #1 clutch will slip or shudder during the transition from a dead stop to forward or reverse movement. Honda’s remedy is a new clutch cover that provides additional cool oil to the twin #1 clutch packs. Nothing has been done to address the weakness of the #1 clutch packs to handle abuse because, according to Honda, it is operator abuse as documented in their Service Bulletin SxS1000 #3, plus the official letter given to purchasers of the 1000s, basically reminding purchasers to follow the operating guidelines as outlined in the owner’s manuals: “Dummy!” So, what will you find? Most likely a standard wet-plate clutch that has been overheated, Boot. A charcoal smell to the plates and maybe the oil. The clutch packs, if disassembled, and the friction discs would be dark in color and glazed shiny. Dismissed! We have a Linhai 28 4×4 Bighorn. The machine has an automatic transmission with a shifter lever that has H, L and R on it. Yesterday, when my grandson was using it, he found he could not get it into gear. When trying to shift from neutral to any gear (H, L or R), it would only grind and never go into gear. If we shut it off and put it in gear then start it, it will run in that gear with an occasional clicking sound coming from the trans, and you cannot change to any gear while the engine is running, only to neutral. The grinding is exactly the same as you would experience if the idle were too high, say 2000. At that high rev, the gears will grind and you will not be able to shift, but it is happening at the normal idle speed (we keep the idle at 1500–1600, which is the lowest idle the engine will run at, and at that idle speed we never had a problem shifting before). If it were a manual transmission, I would describe the problem as a severely worn clutch not disengaging. The machine was purchased about three years ago from an out-of-town dealer in North Carolina, and we are in Florida. There are no Linhai dealers in our area. Since we purchased it, it has not had a great deal of use and definitely no abuse. I have checked the linkage, which seems to consist of two steel bars that control two switches on the top of the trans, and they appear to work okay when the engine is off. Can you help me diagnose what could be causing the grinding? Well, Boot, I see where there may be two problems. The first is your grandson actually damaged the transmission, because I don’t like the clicking sound from the transmission. The other possibility is the shifting rods are out of adjustment. Here is a service manual for your 400cc Bighorn 28, which costs $19.99 for the download: www.emanualonline.com/atv/linhai/lh-models/lh400/linhai-lh400cuv_2-bighorn-cuv-workshop-repair-%252526-service-manual-%5bcomplete-%252526-informative-for-diy-repair%5d-%252526%25252397 34%3b-%252526%2525239734%3b-%252526%2525239734%3b-%252526.html?currency=usd&gclid=eaiaiqobchmi7_6rzyyq3aivcpyzch0vzgc0eaqyaiabegjp-pd_bwe. Chapter 6 covers the shift-rod adjustment. The procedure is a bit too long for this column, Boot. Also, here is the Linhai website with parts catalogs: www.linhaipowersportsusa.com/service/linhai-parts.html. If your grandson did damage the transmission, I expect him to be placed on report and be peeling potatoes on KP for two weeks! Dismissed! I have a 2016 RZR 570 with 400 miles on it. I ride mainly the Hatfield-McCoy trail system and scrape quite a few rocks with the skids. The shocks are on the next-to-firmest for preload. Which would be a better route to gain more ground clearance—new springs or a 2-inch lift, then back the preload off? What would be the best overall in terms of the longevity of the joints and such? Thank you. Private Fishgill, if I were in your riding conditions, I would install a 2–2.5-inch lift kit, 27-inch tires and then I would test with and without the sway bars installed. The lift kit will give you almost 2 inches of more ground clearance. The aftermarket springs will restore the factory-new sag because the factory springs sag quite a bit, requiring increased preload. The sway-bar removal will allow increased suspension travel. None of these modifications will hurt the CV joints. Be aware, Boot, that each modification will make the Zooter more tippy than stock. Given the conditions at Hatfield-McCoy, I think a decent rider can handle the increased tippiness for the reduced scraping. Scrape some peel off some potatoes, Boot! Dismissed!